2 x 4s and plumbing pipes are the performing objects in Leibniz’ Folly. They probe into the 17th century philosopher Leibniz’ belief in the existence of minute perceptions and consciousness in matter. 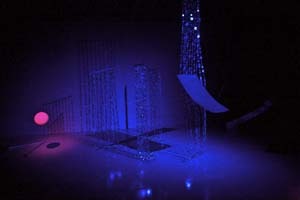 Manipulated through a counterweight stringing system the movements and gestures of these materials are remarkably expressive; collaged with text, sound and light they set out to verify Leibniz’ metaphysics. 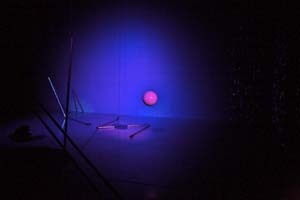 To construct a performance around Leibniz’ ideas on the possibility of perception in matter provided a perfect vehicle for Hanne Tierney’s artistic focus: looking for the profound in the ordinary. Here it is embodied in the echoes of long copper pipes reverberating in the air, or the visual delight of a shimmering choreography of metallic beads.